I have been in a terrible funk. It was rainy and damp, cold and grey outside for so long that it really did me in. But I am back to myself again. I made a quilt top for one of the charity projects that I am involved with. I had to order new side clamps for my longarm and got them last week. I just tried them out quilting a baby quilt for my local hospital. I love them! They hold the tension to the back of the quilt perfectly. However, I just caught some grief from my husband because I put my very last needle in the machine. He is my acquisitions person and he hates to have to pay to rush an order. So since the clamps work so well, I will start quilting the top I made the other day. This Tuesday is my guild meeting. I am giving a demo on one seam flying geese units. It’s pretty cool and they add a bit of dimension to your piece. Let me tell you, I have never been good at making flying geese units. No matter what I do they always look wonky. But I will definitely make them this way. My very first one was perfect. I am in charge of my guild’s website. I love working on it and I am always looking for interesting things to put on it. It’s amazing how much of a resource it has turned out to be for our members. When I joined this guild in 2005 many of the members didn’t want anything to do with a website. I think they were afraid of it. So I designed a site and put it on a free server until their questions could be answered and I could show them how to navigate it. It has been a huge success. Have I ever said I love Pansies? Well I do, I really do. They are one of my all time favorite flowers. They are just happy and when I see them I am happy. In November my daughter was organizing a plant sale for a fund raiser for her masters program association. She got me a flat of pansies. I waited forever for them to start to bloom. They usually bloom all winter long down here in North Carolina, but this was a horrific winter. Finally! 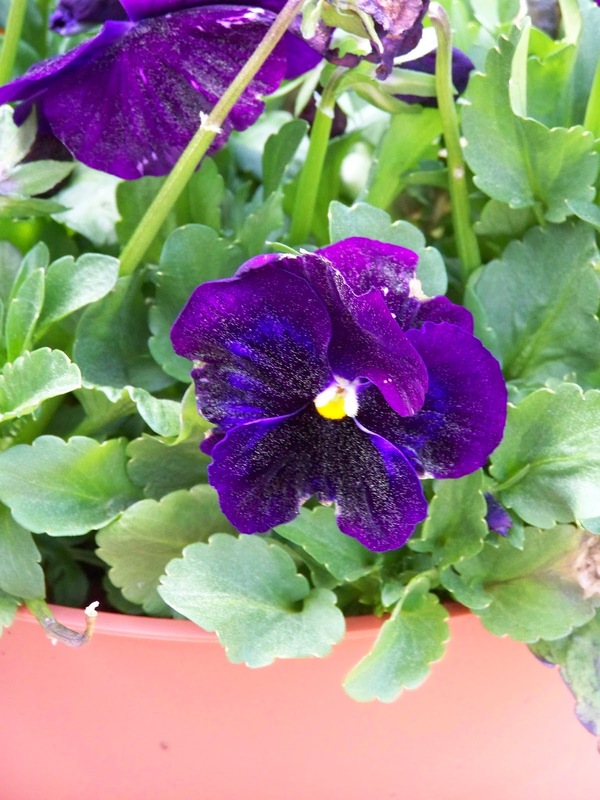 Here’s one of the pansies. See? Happy!